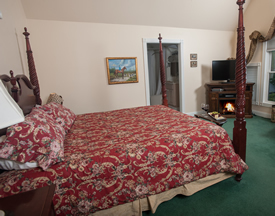 Our 1892 inn’s main house is a beautiful Queen Anne Victorian mansion containing eight upstairs guestrooms, all with private baths and fireplaces. A newly completed renovation in 2004, the 1899 carriage house is located just south of the main inn. 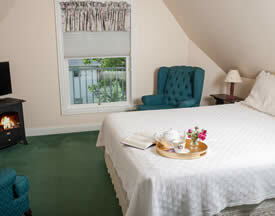 The Carriage House features two suites, each with a private entrance, patio, kitchenette, and off-street parking. 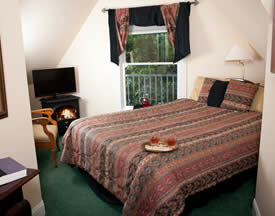 Our ADA-approved accessible suite is located in the Carriage House. 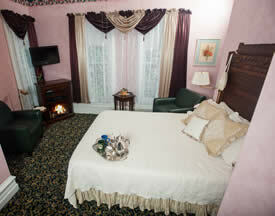 All rooms can be reserved through our online reservation system or by calling 217-824-7220. *Corporate rates & Bereavement rates available on Sunday – Thursday. Call to arrange: 217-824-7220. 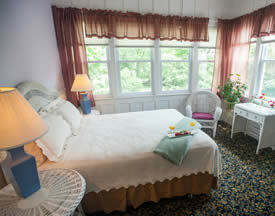 **Our fine Central Illinois bed and breakfast is a smoke-free environment.